This innovative wide area rotary mower features an all out-front mower deck for superior operator visibility and outstanding productivity. The Groundsmaster® 4100-D is equipped with a powerful Kubota® turbo-charged, 58 hp (43.3 kW), diesel engine and provides a 10.5 ft (3.2 m) width of cut for exceptional productivity. Full-time bi-directional 4-wheel drive provides superior mowing capacity on hills and slippery conditions. 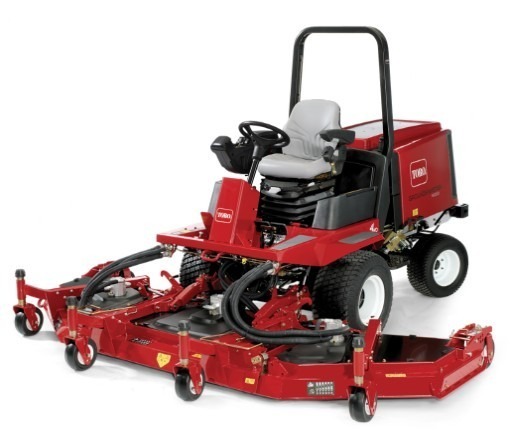 The Groundsmaster® 4100-D/4110-D delivers 58 hp (43.3 kW) and 92.2 N torque at 2,000 rpm. With so much power at your disposal, it’s easy to digest even a large amount of wet, thick grass. With its unmatched engine torque and patented hydraulic motors that directly drive spindles on each deck, the 4100-D/4110-D delivers power where you need it most to cut tough grass. Plus, the shallow deck design forces quicker clipping dispersal, allowing the decks to accept more grass on a faster basis. Operators will like the Groundsmaster® 4100-D because it is amazingly quiet. Its low engine speed, low-noise technology gear motors, and a variable-speed cooling fan clutch all contribute to greatly reduced noise levels. Plus, amenities like a multi-size beverage holder, 12-volt power outlet, and a portable radio holder make work more comfortable. Heavy-duty welded steel decks and frames provide extra durability and long life. Each wing deck features an impact absorption system, protecting deck components so you have less down time and more productivity. 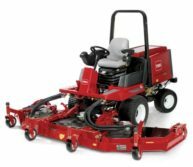 The Groundsmaster® 4100-D is based on the Groundsmaster® 4000-D design, which has proven itself for durability and reliability. In addition to effectively mowing a 54` to 10.5′ swath, the Groundsmaster® 4100-D/4110-D offers incredibly tight trimming capabilities. It allows you to trim how you want with one, two, or all three decks engaged, depending on the situation. The 4100-D/4110-D also features a unique, patented, parallel hydraulic traction system in forward and reverse that makes it much easier to trim around a tree or object without scuffing even while traversing a hill. The all out-front deck gives the operator superior visibility and an excellent quality of cut. The mower deck’s integrated design gives on-the-go flexibility of three cutting widths, 124` (315 cm), 89` (226 cm) and 54` (137 cm). The Groundsmaster 4100-D deck chambers pivot 17 degrees upward and 15 degrees downward assuring you of excellent ground following capabilities.